It has been quit some time I was on the water. Strange thing: i do not care. I do not miss it, and I have got other things on my head. That maybe helps. I am very very busy in my van. It is slowly turning into my dream surfvan. Look under the TAB Surfvan conversion and see it yourself. On the internet you allready can find some pictures of the 2012 Vapor. I have posted them here, so you have a nice overview. I am only gonna replace the 11.0 2009 by the 11.0 2012 Vapor. And also maybe replace the 8.6 2011 Vapor by a 8.6 2012 Phantom. Thursday 13-10-11 I received my new board. The Manta 79 FR 2012. Why a FR and not a PRO version for me? Finally I found some time to update my blog. August 26th we went on the summer holiday to Spain. We stayed there for 1 month. Enough time to get into the holiday mode. 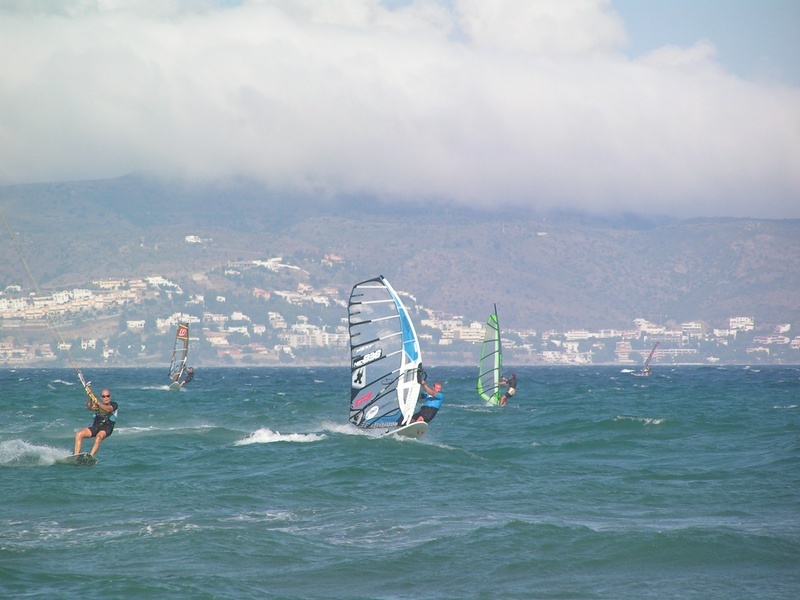 We had great weather (30 degrees), 3 times some rain, good foods, nice people and some nice windsurf sessions. I did not surf so very much this time, and I lost some sessioninfo because a GPS was not working correctly. So I made more distance than I could log on the internet. Here is 1 track. You can see were I started (camping side) and were I went to (Rosas). It was a nice trip. Most of the time I used the Formula gear. But there were some days with good winds. 1 day in particular, I could use the Manta65 and 7.1m2 Vapor full power. It was very nice. 26 degrees celsius water temperature, 30 degrees outside temperature and WIND. This set rocks. Still under development, but here is a first glimp of the 2012 Vapor. I will replace some sails (not all) next season. I am thinking about replacing the 7.9 , 8.6 and 11.0m2. 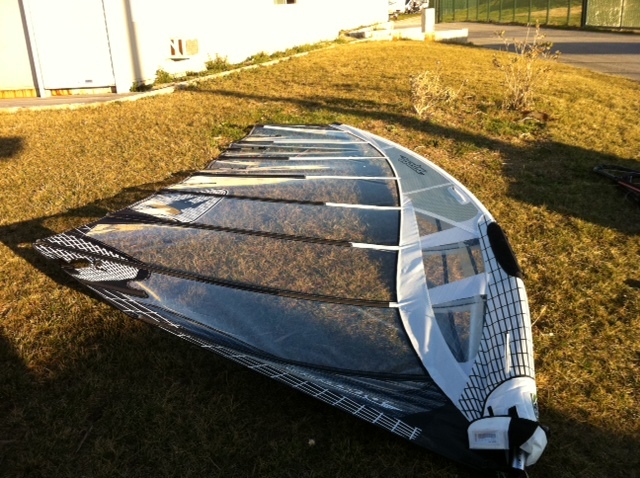 So if somebody has interest in these sails (11.0m2 is a 2009 sail) just contact me! 1 month back I started training in the gym, where there is a schedule made for me, especially for windsurfing and to loose some fat, gain some muscles. Now, after this first month I can say progress is better than I could hope for. Especially my belly (which is gone for the most) and my arms (which are getting bigger) are going very good. Only the chest muscles are not so good, and the weight I am pulling is still low. I go 3 times a week minimal, more is better. I have 3 schedules, 1 for each day (the thought was to go 3 times a week). This winter, if it is too cold to surf, I want to go 6 times a week, and I split up my 3 schedules so I do 1 or 2 muscel a day. Besides that I take 2 shakes a day with egg white, after a training I also take sugars in it. This winter I want also to take creatin for 5 weeks. For those who is interesting here is my schedule. 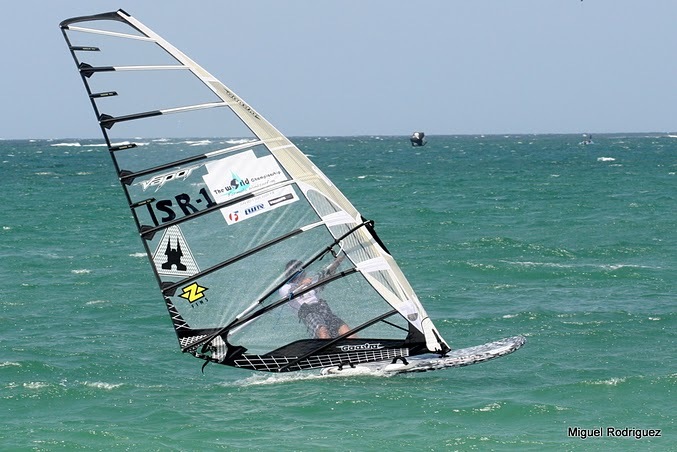 Last week Arnon Dagan participated @ the Formula Windsurfing Worlds. He also used a 2012 Vapor proto. Here are some pics I found on the web. Can you find the differences? Only thing I see is a different strap for the clew, and maybe the topbatten is positioned different. I even might see some more curve in the battens. Last thursday we (Marjan and me) were on the Brouwersdam @ the kitesurfcenter http://www.natural-high.nl/ for a kitesurflesson. Not me, but Marjan had here first experience with a kite. All went quit good, and she is looking forward to her next lesson. Why I did nor participate? Well, I think I like kitesurfing also, and my van is allready full with windsurf equipment and I like windsurfing too much. You also can have TOO much hobby's I guess. If you ever want to go to a nice beach + kitecenter + beachclub, shops and nice atmosfer. Natural high is the place to be I can tell you. Very nice people over there that are running the place and of course Brouwersdam is 1 of the most beautiful windsurf and kitesurfplaces in Europa. I will post some pics later of this nice day. There aren't exiting things happening last weeks to put on this weblog. Of course I have been windsurfing, and making TOW. But no recordbraking circumstances but just having a nice time on the water. Last month I have been using the 8.6m2 Vapor 2 times, 11.0 m2 Vapor 3 times, 12m2 Vapor 2 times and 7.9m2 2 times. So not really windy. Since a couple of weeks I am going to the gym and that is working great. Last friday I went to the gym in the morning, traning biceps, triceps, belly and lower back and in the afternoon I did 100+ km distance with the 12.0 and 11.0. That went okay, but the day after I had serious muscular pain. I nice pain because you have the feeling you did someting healty! 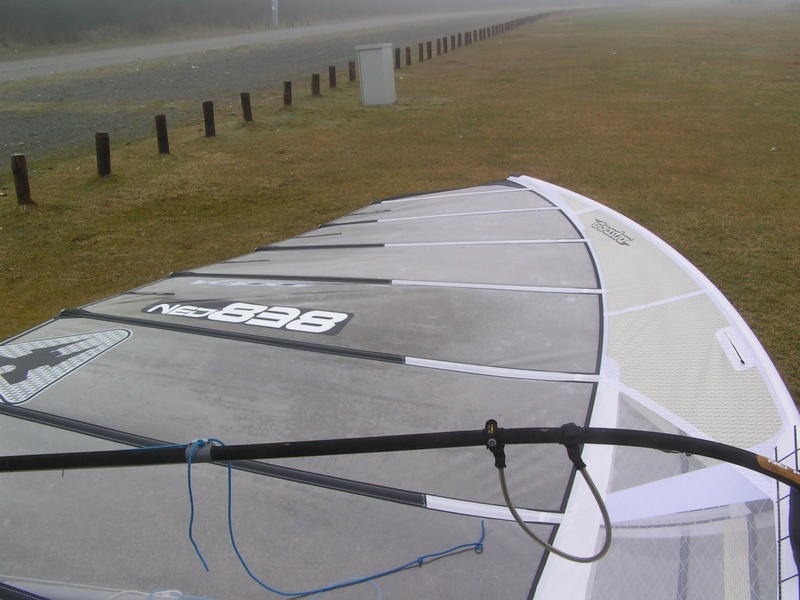 Here a small picture of a session last month with the 7.9m2 Vapor and the Tabou Manta65. Sail downhauled as recommended + 2cm extra downhaul. 7.9m2 Vapor + Tabou Manta65 on spot "Oostvoornse meer"
The forecast was good for yesterday to do some distance: around 17 knots all day. Even the evening before, when I checked the windstats, I still saw the 17 knots. Awakening 0600 hr in the morning there was no wind? Indeed, the forecasts changed, but I still went to the water. I hoped for rigging the 7.9m2, but I ended up rigging the Formula with 11m2 and my fast 68R13 fin. But the wind was sometimes too less, and I even had to pump once in a while. Slowely the wind increased and I had 50+ runs on the Formula. Went back to shore, rigged the Manta79PRO + Gaastra Vapor 8.6m2 with the C3 Sting 46cm. Not full power all the time, so I rigged the 8.6 in low wind mode. Later on the wind increased and I could do some speedruns. The counter stopped at 207 km totall for today. But they were not easy at all. 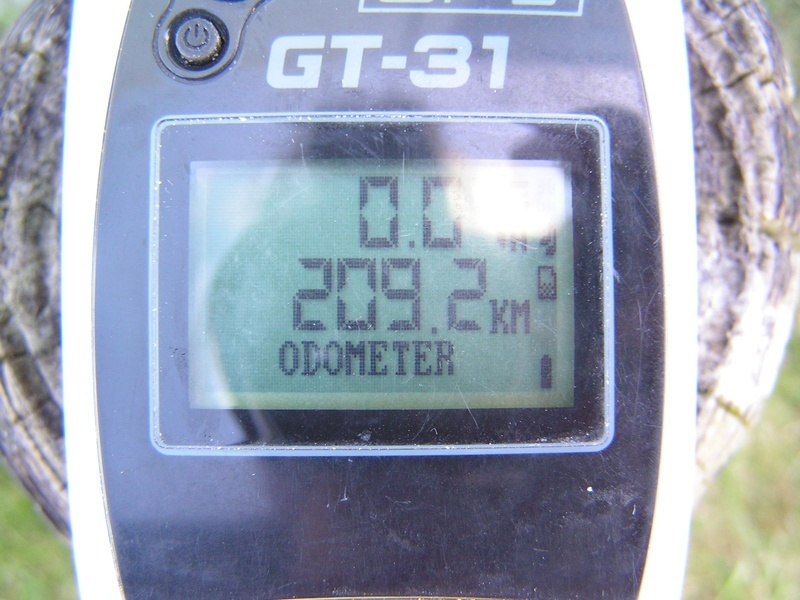 I think, with good "normall"wind, 300 km must not be such a big problem for me. Hopefully next time! Tommorow I am going to a new spot. It is not a surfspot, I think there has'nt been a windsurfer there for ever. It's my hometown: Middelharnis. So it takes me only 5 minutes to get there. There is a little beach for the locals, so it's very easy to get into the water. A small island the Slijkplaat is just 2-4 miles ahead, and that island could give some results with Formula or the big slalomstuff and NW-N-NO winds ... keep you posted! Finally I completed my range of sails. Yesterday I got the 5.2 , 5.7 and 7.1m2 and allready the next day I could use the 7.1m2. Perfect! The forecast was good at the coast with 30 knots from South West. Only I was wondering if the wind would not be too much South for speedspot Herkingen. At the last minute I decided to drive upto the Veluwemeer, spot Bad Hoophuizen for a speedsession. So instead of driving 5 km, I was driving 160 km to get to the spot. 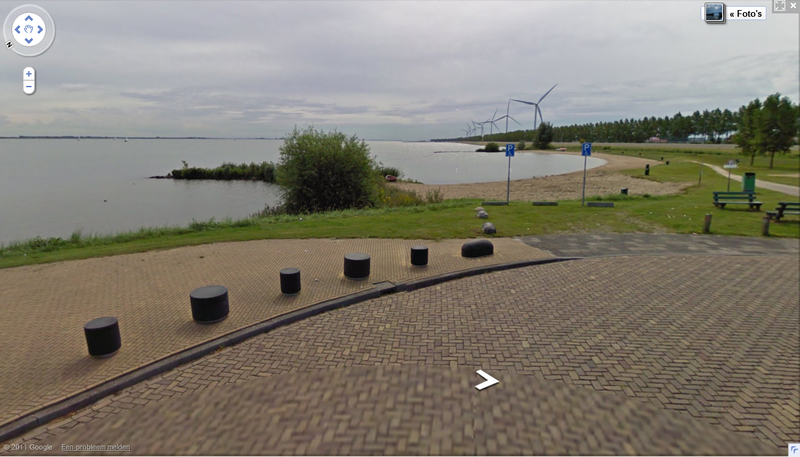 The Veluwemeer always has been gusty compared with the wind at the coast. But afterwards it was a good call: the wind was gusty in the whole country. I rigged up 7.1m2 Vapor + JP Speed49 with the 23 cm C3 Slingshot. Also - in cause the wind would increase - I rigged the 6.4m2 Vapor + JP Speed45 and 21 cm C3 Slingshot. I used the first set all day. During the gusts I had full power in the sail. The controll is amazing. First I had - 2cm downhaul as recommended. Later on I increased downhaul upto +1cm. I think downhauling the sail as recommended would be the best. I always have had the 6.7 and 7.6 sails. 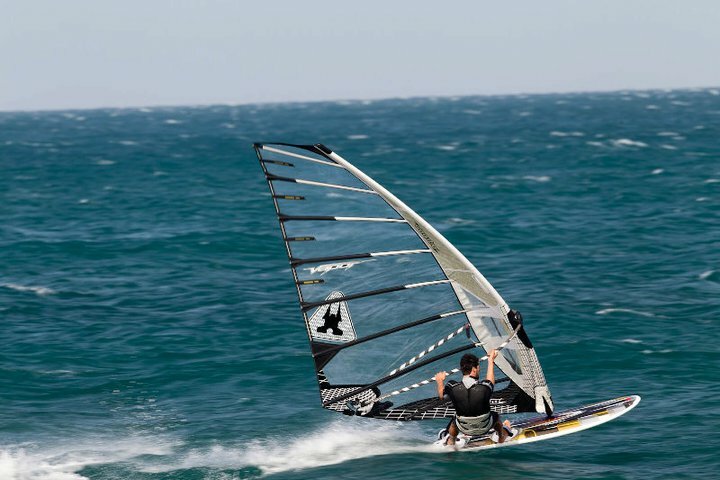 6.7 was sometimes too small, and 7.6 was always a little bit too big for speedsurfing. The 7.1m2 is a perfect size, and this was the sail I was looking forward to. So it was very nice to notice, the sail indeed does it's job good: it does not feels too big, and still you have enough power to get you going if the wind drops a little. 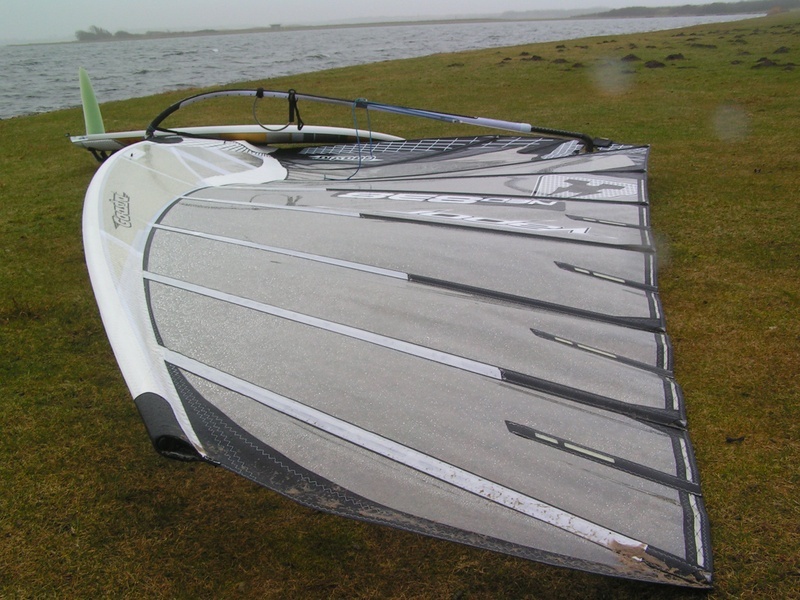 Just like all the other sizes I have used up to now, the 7.1m2 is also very controlable, steady, has a big range and just sails beautiful. I did not take any spacers out, but maybe I'll do that for next time. The cambers all rotate, but it goes a little bit stiff and with a big bang. 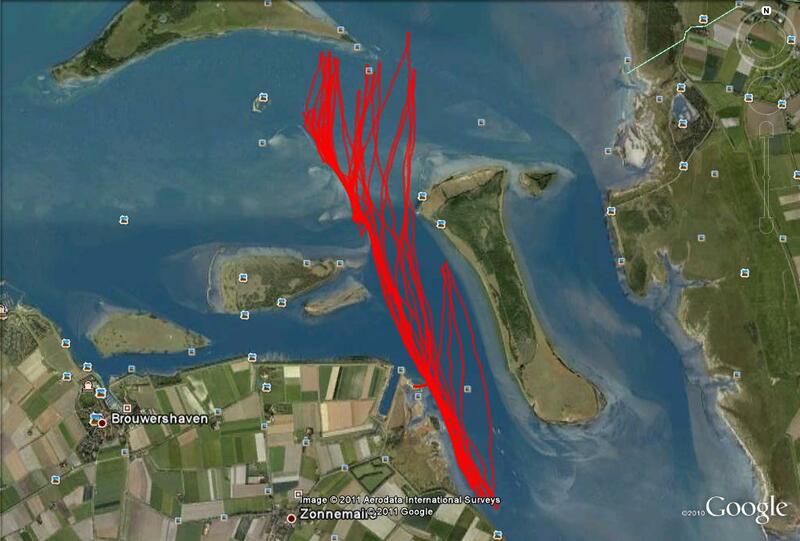 With wind between 14 and 17 knots, and lowtide, it was a nice session on the sea (Northsea), wind coming from West. 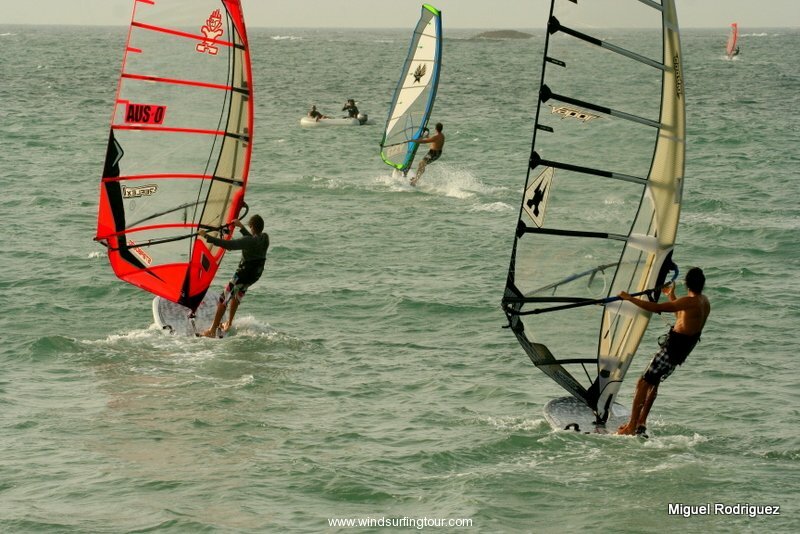 I took the 125 ltr MantaPRO + Gaastra Vapor 2011 7.9 and C3 Sting 46cm and had a great time. Speed max was 53 km/hr, and it was pretty wave. The set rocks! I think I have a new addiction: going 60+ km/hr on the 79cm wide Manta79 with the 7.9m2 on it. Today, went to the water for a short 1 hour session. I had worked the night shift and not feeling so well, and sometimes it helps to get on the water and to fresh up your head. I freshed up, but it did not help. Now I'm feeling more sick. The wind was very very gusty. 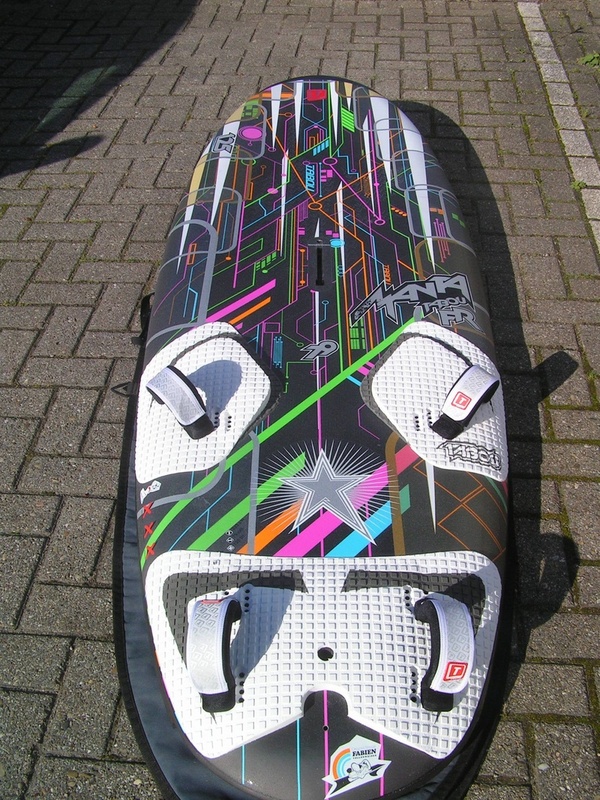 I went for the big slalom set: Manta79 + 7.9 and 46 cm fin. It took 30 minutes to tune up the set. First the board did not took off, it sticked to the water OR it went into the air in a gust. Back onshore, gave the sail 1cm more downhaul, set the boom a little bit higher and went back on the water. Speed went up very shortly to again 60+ : 63 km/hr on display and 60 km/hr run. Unluckely I only had 1 gust. When I was derigging the wind started to increase. It looks like I was on the water just between 2 periods of wind. Last week I was in France (Gruissan) for the Belgian speedweek. The 1250 km drive took me 12 hours this time, the van does'nt goes any faster. I arrived on Sunday afternoon and described for the week. 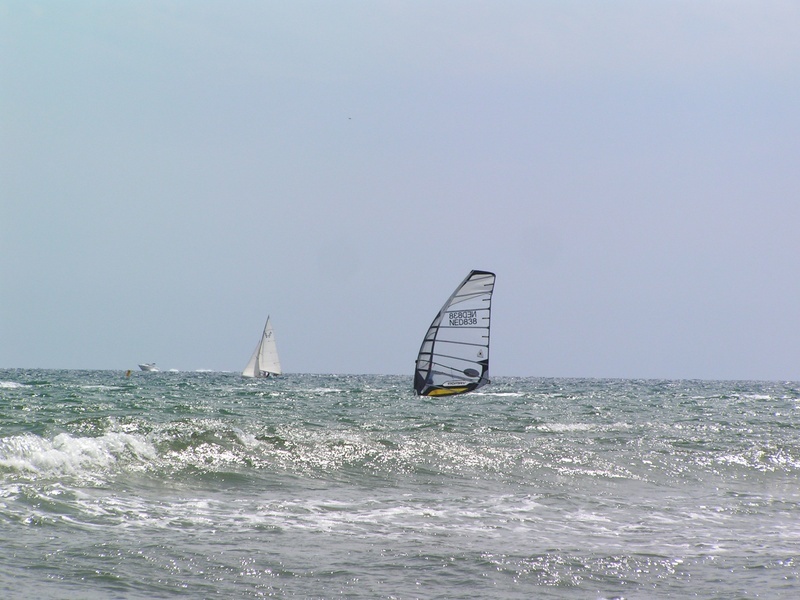 All week there was no Tramontana, the wind we need to use the beach for the 500 metres course and flat water. On Monday we went to a lake nearby close to campingsite La Nautique. Looking back this was the fastest day of the week. There was no match so we took time to surf by our own. Just before I drove to France, I picked up the 2011 Vapor 7.9m2. Luckely I did, because I used the 7.9m2 all week! First I rigged the Tabou Manta79 + 8.6m2 Vapor and 46cm C3 Sting and was playing with the low wind setting. Tuesday there was not enough wind. On Wednesday we had the first heat of the competition. This would also be the only heat. The wind was there, with minimum of 20 knots at the starting line. But on 50% of the 500 metres course there was a small winddip. Not all the time, but 90% of the time. I decided to go for big. Unluckely for me, I had to go over the course with left front foot, this is my worst side. But strange enough on my big Manta79 this is less a "problem" than on my Manta65. So I took the Manta79 + 7.9m2 and 44cm C3 Sting. The course was laying in the chop, you could say these were slalom conditions. I had 2 nice runs over the course, but not really powerfull all the time. But the numbers told me I was 7th, so that was nice. Thursday and Friday again we did not have competition. Wind enough for surfing (especially Friday) but not enough for competition. Both days I used the Manta79 PRO with the 7.9m2 Vapor. Friday evening we had the closing ceremony. After the numbers 1, 2 and 3 were on stage, the 1st price was drawn. My name felt, after they pulled out a piece of paper. A Maui Sails TR4 4.3m2 was the price. My first price ever won, haha! For those who also want to order the C3 fins. I have ordered them at http://www.tribu-surfshop.com/ in Belgium. But they send fins all around Europa. When you buy 2 fins you don't pay for sending! Yesterday 31th March I had the first speedsession with the new gear. 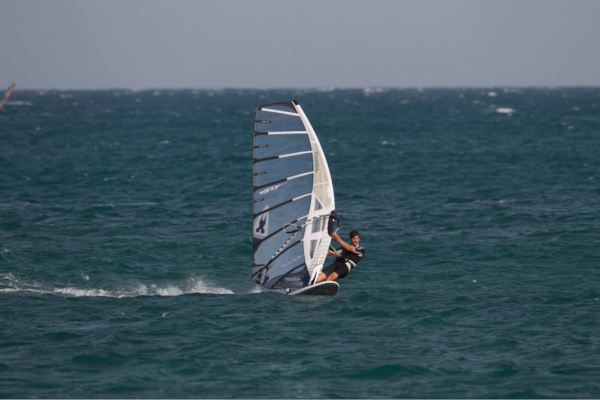 I rigged the 6.4m2 together with 2 boards: the Tabou Manta54 and the JP Speed pro edition 49. I put the 25cm C3 Sling shot in the Manta, and a 23cm C3 Slingshot in the JP. Wind was 30 knots, gusting 40 knots. All went very well. First the Manta was the fastest, but after the wind was more steady hitting the 40 knots, the JP was faster. 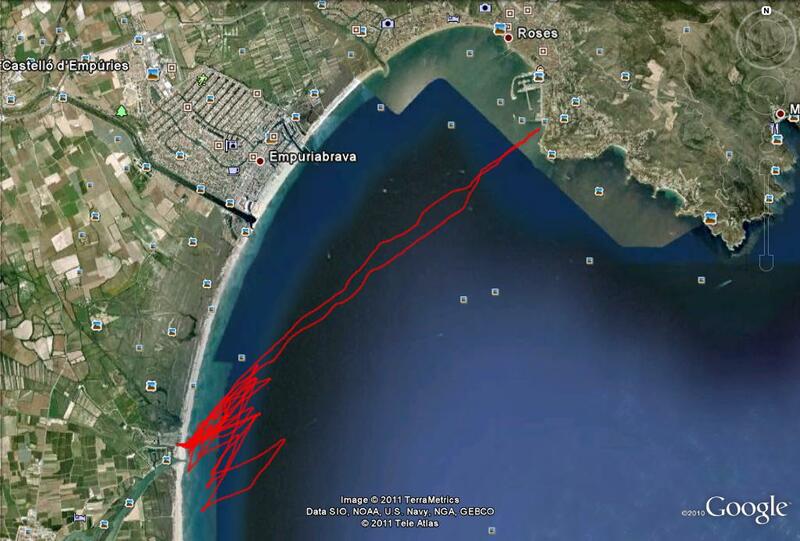 Max speed was 41.5 knots, average was 38.5 knots and best run 39.60 knots. What a nice week this is allready. Yesterday (Sunday) went to the water. 12 knots was predicted. When I came there, the sky cleared up and there was enough wind for the 12.0m2. A bit cold tho at the hands, while the wind came from North. Later on the day, the wind shifted and increased quit some knots. Went back a shore and rigged up the 8.6m2 Vapor and has some TOW with the Manta79 PRO. I think I have found the trim of the 8.6m2. I removed the spacers at the lowest camber that is placed in out of the factory and gave the sail 491 LUFF. Good enough for the 14-17 knots wind. Did 70km distance. Tomorrow also looks promising with 13/14 knots wind. So I take the 12.0 again or my good old 2009 11.0m2 Vapor to do some distance. Also rigged up the 6.4m2 last week, here it look likes, nice don't you think? Found out that the best extension for the 8.6m2 is 2 cm instead of 4 cm for lowwind and midrange. Maybe for high end the 4cm will do the job fine. Here are some more pctures of the 8.6 and also of the 12.0. I think I over-downhauled the 12.0 a bit yesterday after the things I learned today. Yesterday (February 23th) I had the first session with the new Vapor. 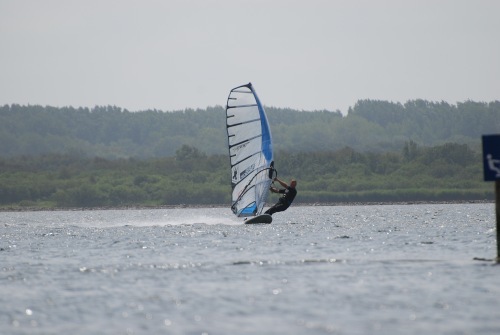 Together with a new board (Manta79 PRO) and new fin (C3 Sting 46cm). What a sail! Stabil, soft, rotation is perfect and loads of power. 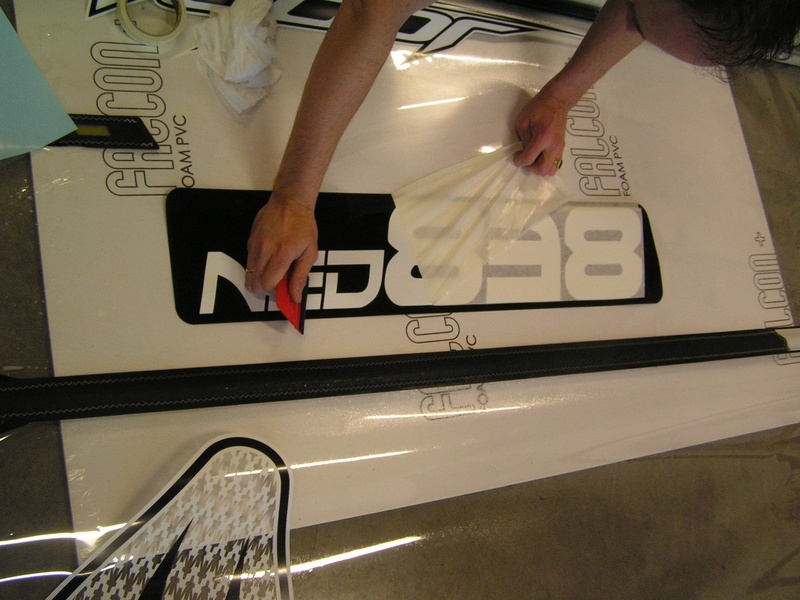 Today I started putting the stickers in the sails. I made some pics of it. December I started jogging again. And it goes better and better. Today, again did some distance (12 km), and I try to do that for 3 - 4 times a week. Last Tuesday I had another surfsession. This time with the Formulagear (11 m2) and the North Sea. Offshore wind, flat water and sunny. Those are the things I like! 17-02-2011 My new sails are coming! Yesterday I had a nice mail in my mailbox : your sails are on their way to the shop, and it looks like you get all the sails you ordered! So, hopefully I have them tomorrow or Saterday. 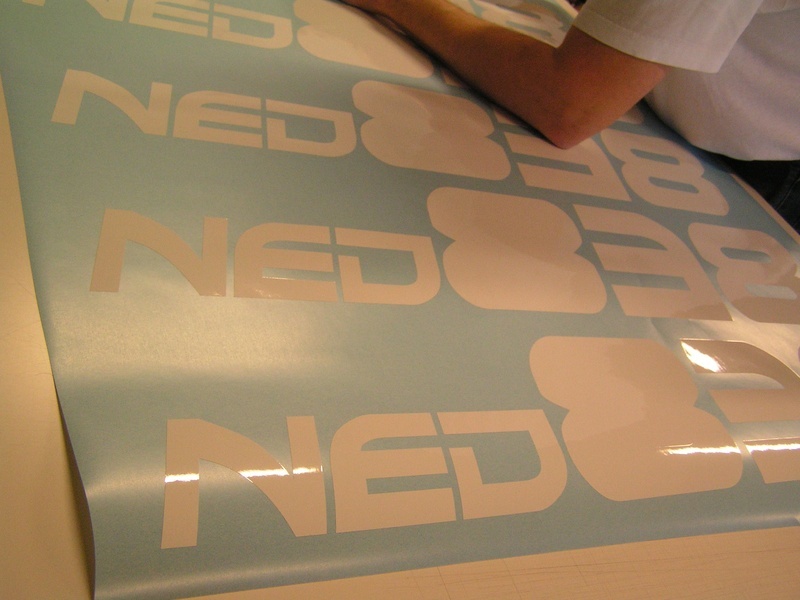 Also I made a new design for my sailnumber NED838. Hopefully I can make pictures as soon as possible with the 2011 equipment! It's january, just before the new season starts. 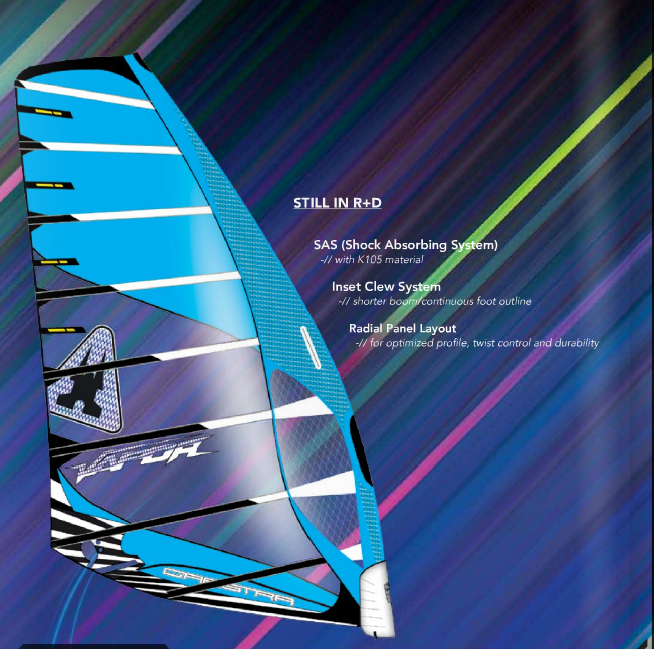 Time to sell and buy windsurfstuff. (19 cm Sling Shot) - (21 cm Sling Shot) - 23 cm SS - 25 cm SS - 26 cm JP Speed - 28 cm C3 Venom - 28 cm Tectonics Falcon F1 - 30 cm C3 Venom - 32 cm C3 Sting - 34 cm C3 Sting - 36 cm C3 Sting - 38 cm C3 Sting - 42 cm C3 Sting - 46 cm C3 Sting - 68 cm Deboichet R13 M+ - 70 cm Hurricane FRB8 S- - 70 cm Buscadore Custom 80 cut 70. 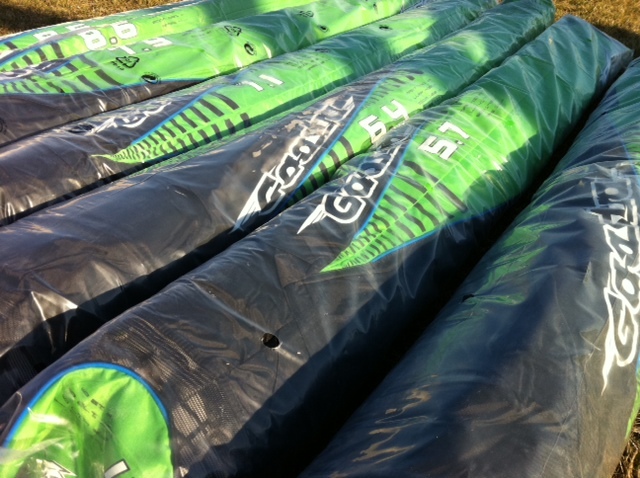 The 5.5 and 8.4 Vapor sails are sold. The 5.2 + 5.7 + 8.6 + 12.0 2011 Vapors are ordered. Still for sale are the 6.0, 6.7 and 7.6 + some masts. The Tabou Manta79 2010 is sold and I ordered the 2011 version, this time a Team Edition. Finally back on the water! With airtemperatures hitting the 10 degrees, and wind from the west gusting 35 knots, it was time to go back on the water! Watertemperature is still very low (approx 3 degrees) but it was pretty OK. 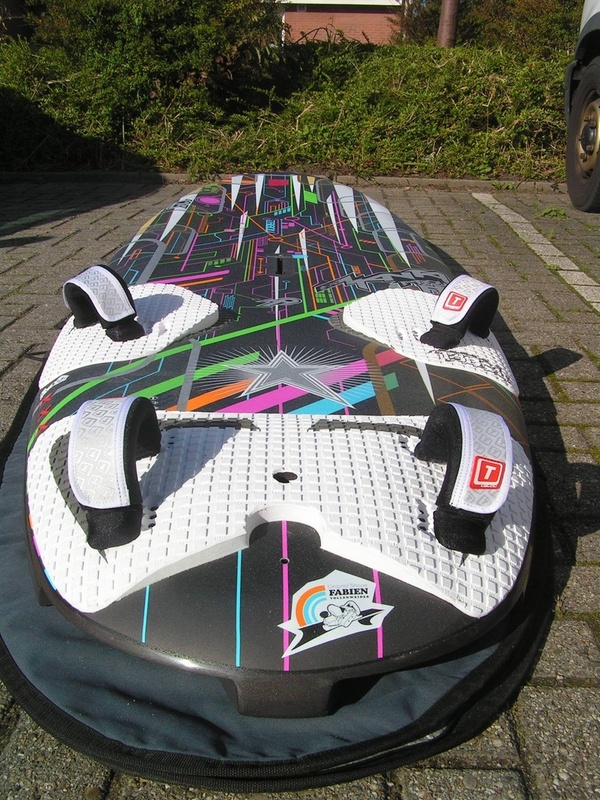 I have bought 2 new boards, speedboards. My first speedboards ever. The JP Speed Pro Edition 45 and the JP Speed Pro Edition 49. Because I have not got my fins yet for the 45, I took the 49 + 6.7m2 and a 28cm C3 Venom. I took me a while before I had the trim right. But still the board was a bit sticky. Allready after 30 km distance all my energy was gone. And now, the day after, I even feel my muscles. So I have to work on that to get fit again. Here is a picture of the all new Gaastra Vapor. The sail comes in new sizes : 5.2 / 5.7 / 6.4 / 7.1 / 7.9 / 8.6 / 9.5 / 10 / 11 /12. No 4.30RDM anymore. Both the 5.2 and 5.7 need the 4.00 RDM. The 6.4 needs a SDM mast. I want to wish everybody a happy newyear. All the best from a cold Holland!! !